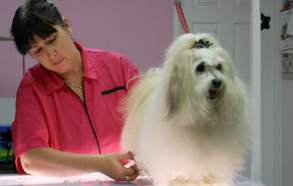 Rina has been grooming cats as long as she has been grooming dogs, almost 30 years. We do bath and brush, full body haircuts including the lion clip. If you have a cat that needs to be groomed, call us and lets get your kitty scheduled! Find out more about our pet sitting services. ‘VOTED 2008’ Best Grooming in Denver 2009 Results: 2nd place in the grooming category, and still the #1 salon! Thanks to all who voted! We hope to be back on top in 2010! Don’t forget to check in on Facebook when you drop of your dog for grooming and recieve a FREE teeth brushing or FREE gourmet dog cookie. Tired of so called ‘Super Stores’? Never know who you are going to talk to or if they are experienced? Then try us!! We, at A Paw Spa, know your pet is a member of the family! Our store is cute, clean and welcoming and you will never be just another face in the store. Let us welcome you back to a hometown grooming salon where you will enjoy being treated like a friend and your pet will enjoy being treated like one of our own. Late Drop Off Fee $10 if you are more than 30 minutes past your scheduled appointment time. Late Pick Up Fee $15 for every 15 minutes past closing time. A Paw Spa now has a facebook fan page, like it here: Join us on Facebook. Our facility is clean and modern! Grooming is in the open for all to see! Our retail selection is unmatched! Self Service facilities are open 9 hours a day! We have a covered outdoor play area!